Chapter 2: How to Evaluate a house using The Eight House Theory? Step 1: Click one of the following buttons for your YEAR of birth. Find the date that matches your BIRTHDAY. In the above example, remember that we use a MALE born on 5 FEBRUARY 1981. You therefore click the North link. Print out a copy of this template and safe-keep it. You will need to use it at a later on. Tip: Why not print it on a overhead transparency? Step 4: Obtain a layout of the house you are evaluating. 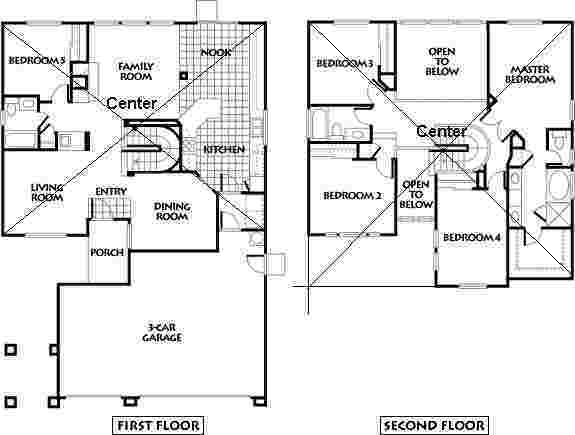 What is the purpose of obtaining a copy of your home layout plan? 1. All architectural layout plans will show a NORTH compass direction on the plan. Use this as a REFERENCE when you check the direction of the main entrance door. 2. If the layout plan is too large e.g A3 and B3 paper size, you can very easily reduce the layout plan scaled to size at any photocopy machines to a manageable A4 sized sheet. Take a look a the sample copy of a typical layout plan below. Did you see a compass direction with the North on the top right-hand side of the plan below? If your answer is YES, Please read on. If you did not see a compass direction as shown on your home's layout plan. Don't worry, it may be found on another layout plan of which has your entire estate/community. In this case, you have to figure out the North/South direction and mark this on the copy of your layout plan. Later on, you need to use an ordinary compass to confirm the North/South direction as shown on the layout plan. If you do not have a proper layout plan of your home, I suggest you try obtaining it from the previous owner or approach the builders of your house or obtain a copy from your municipal office in charge of building control. The last resort is to draw a layout plan yourself! But bear in mind that it should be proportionate in size! There may be a service charge by the authorities for this service. Step 5: Determine the `centre' of the house. Now that you have your layout plan, make use a photocopy of it as your working sheet. Majority of houses are rectangular, squarish or near rectangle in shape or have `4 corners'. It is thus easy to determine the CENTER of such houses. How do I determine the CENTER of a house? In the above diagram, the `grey' dot represents the CENTER of the house. 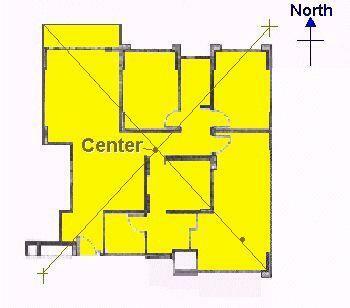 More examples of how to determine the CENTER of a house. Tip 1: Take into consideration only `living' quarters i.e. exclude the garden and the drive-in garage. Tip 2: What happens if my house has two levels? A ground floor and a second storey? Usually, the second storey's floor area or footprint is similar to the ground floor. The CENTER of the second storey should be the same even if it `lands' on the staircase area. Note: Presently, there are differences as to whether we should consider the garage as part of the house to determine it's centrepoint. In my example, I left out the garage area in finding the centrepoint of the house. Usually, part of the garage is an extension of the house and not occupied by humans. Those who argue that the garage must be included as part of the house cannot provide a rationale for this other than to accept that if we often use the garage door, this is considered your main entrance door. When I determine the centre of the house, I would still leave out the garage area. Is there another method of determining the CENTER of a house? Obtain a photocopy of the layout plan e.g. A4 or A3 sized. Find a cardboard and paste the entire layout plan onto the cardboard. Use a scissors and `cut along' the outline of the layout plan. Lastly, use a pin or a sharp object e.g. the sharpened pencil tip and balance the cardboard onto the pencil. At the point where the cardboard balances on the pencil tip is the `centre of gravity.' This is the alternative method of finding the CENTER of the house. Step 6: Determine the direction of the main entrance door. For example if the compass reading for the main entrance door is between 337.5 degrees to 22.4 degrees then in the software program when asked to select the main entrance door direction, please select 15 degrees. If you often use your garage door instead of the main entrance door, under Feng Shui practise, your garage door should instead be the main entrance door. Remember in Step 3, you had already printed out the North house template. For example, if your personal template is " The North House ", superimpose this template aligned according to the NORTH/SOUTH direction of your house's layout plan. You now use this template to look into the various good and bad locations for an individual or an entire family. Tip: Printout your `template' on a Overhead Transparent Sheet. Use this to superimpose on any layout plan. It's that easy! Do the same for each member of your family. For example, look up which room is suitable for each individual of the house by superimposing his/her layout plan on to the layout plan of the house by going through Step 1 to Step 4 again. One important point is that the `head' of the household i.e. the one that brings in the most finance to the house takes priority over the rest of the family as he is the `bread winner'. That is, if you are thinking of purchasing the house; and based on the above template, the house is not suitable for him/her, then avoid purchasing/renting it even if it suits the rest of the family! Congratulations! Want to try out the Flying Star Theory? Click Here.